Customers say how she is super sweet and they love her! She handles all her tasks with a smile and we want to recognize her for all her hard work and dedication. 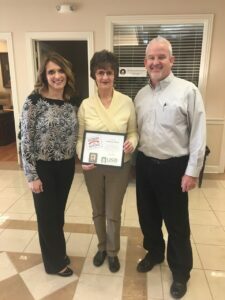 Pictured: Delphene Martin in the center, Christy Stokes, Todd County Market President on the left, and Billly Bingham, Bank President on the right. « Ag Appreciation Day 2018!